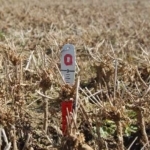 EAST LANSING, Mich. — Thin alfalfa stands result in mediocre yields. You may want to assess a new seeding at this time of year to help decide whether the stand is worth keeping. Reasons for a thin stand include problems at seeding time, pH, fertility, weather problems, die out due to stand age and disease. With experience, farmers develop the skills needed to visually evaluate the alfalfa stand. 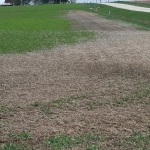 In many cases, good alfalfa stands are terminated on a strict rotation schedule. On other farms, alfalfa stands are kept in place as long as they perform adequately. 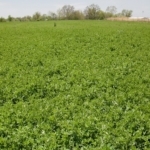 With good soil fertility and management, alfalfa stands can be productive for several years. 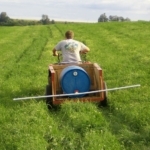 A calculation of dry matter per acre is a simple matter. 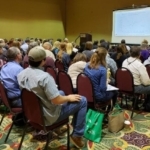 More information on forage sampling, moisture and forage quality analysis is available from the Michigan State University Forage Connection website, your local MSU Extension educator or office. However, a quick estimate of your alfalfa stand’s current yield potential can be made early in the season using a simple technique. Counting alfalfa stems (not crowns or plants) provides a reasonable estimate of the field’s current (not future) yield potential. Judging the field’s future yield potential involves checking the crown and root health of individual plants. 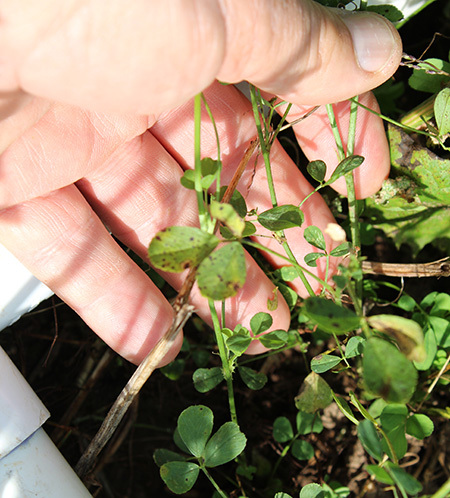 Count the number of alfalfa stems over 2 inches tall in a 2-square foot area. 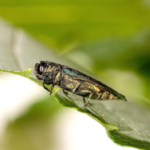 Repeat this three or four times in representative areas of your alfalfa field. Calculate an average number of stems per square foot (divide your 2-square foot average in half). Check on the chart below to see how your stand checks out. Approximately 55 stems per square foot indicates full yield potential. 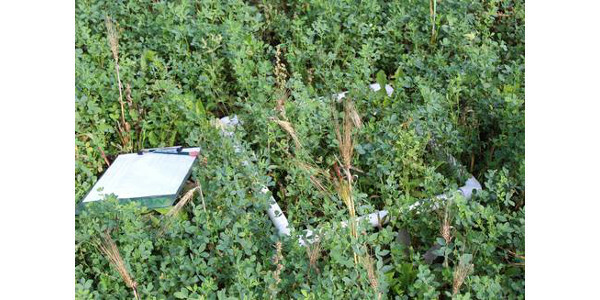 An alfalfa nurse crop trial conducted at the MSU Upper Peninsula Research and Extension Center in 2018 and 2019 includes alfalfa stand evaluation using this stem count technique. 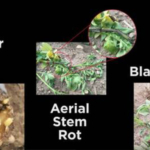 Stem counts were taken Sept. 11 and 12, 2018, from alfalfa plots after nurse crop removal and some alfalfa regrowth. Following emergence, the alfalfa stand appeared thin due to very dry conditions for several weeks after seeding on May 14 and 15. Counting alfalfa stems. Photo by Jim Isleib, MSU Extension. 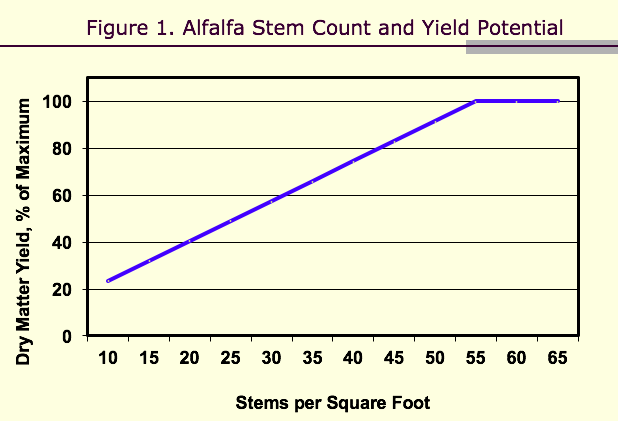 The stem counts confirmed that the average alfalfa stem count for the 76 plots checked was 33 stems per square foot, about 60-65 percent of full yield potential. 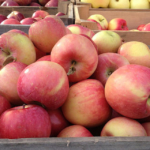 Stem counts ranged from nine to 53 stems per square foot. The three small grains seeded alone as nurse crops at three seeding rates resulted in an average of 30 alfalfa stems per square foot. When forage peas were included, the resulting alfalfa stem count averaged 35 stems per square foot. 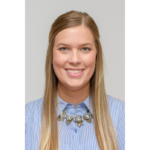 Additional yield and stand data will be collected in the spring of 2019 and a full report completed. If stem count indicates a good alfalfa stand (greater than 55 stems per square foot), your stand can suffer some plant loss and still yield well in the following year. 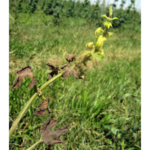 If all of your alfalfa fields have thinned due to winterkill, disease or other factors, you may decide to keep stands with lower than desirable stem counts instead of terminating the alfalfa. 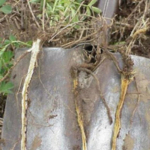 This technique can provide information supporting a decision to rotate to another crop and replace the alfalfa stand elsewhere next year.